How many planes can you own? Come to play #1 addictive game on your phone! To build your own fleet, choose the smartest strategy! - New tournament mode. Play against with other players to win fantastic rewards! •Merge plane to upgrade and fly to earn money. •Variety of planes. There are more than 50 kinds of planes in the game. And some rare planes are waiting for you to collect. •Idle system. Your planes fly automatically. You can get money even when you are offline. Make your plane team become the biggest one in the world! Gold Membership offers a weekly subscription, you will have a 3-days FREE trail period, after this period you will be charged $7.99. After buying this subscription, you will unlock following features: 120% speed of all planes; 120% profit of all planes; add 2 extra space on the runway; 130% offline earnings; 20% off in plane shop. Merge Plane is such a fun game! Can’t stop playing! It’s an amazing stress reliever after a long day at school or work. 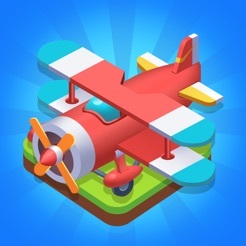 Minimal ads and loads of fun, you can get special power ups for choosing to watch ads and as you continue throughout the game your planes get more powerful! Just by watching a 30 second ad you can get golden boxes which give you higher level planes, you can also get 60 coins per lap for a certain amount of time and the more coins you have the better parts you can purchase! With better parts you get better planes. And as they gain speed from merging they also get more coins each time they make a lap. I’ve always loved leveled games like this, and this may be a new favorite! When I play I get lost in the game and it distracts me from any problems I’ve been having. This game is definitely worth the time to download and play. The storage it takes up won’t even matter once you start playing it’s just that mesmerizing. Great for younger kids too!! My siblings love it and it’s a great way to keep them entertained on long drives. At first I was skeptical about downloading it but my friends loved it so I gave it a shot. Turns out it’s an amazing game. Especially if you’re just trying to kill time. I highly recommend this game. Hi merge plane creators. Remember how I said it was ridiculous that the game needed so much space on my phone? Well I don’t even care about all that now! This game is soooooooooo awesome. The planes go soo fast and it looks amazing when you create a new plane. Like just now I created the dolphin which is the 11th plane and it goes sooooo sooooo fast! It looks so cool! I’m technically a noob since I only got this game yesterday but I’m really starting to love it and because I just made the 11th plane on the second day of playing this game I don’t feel like such a noob anymore! And do u know what’s surprising? You know how I said I just made the 11th plane in the second day of playing? Well it’s hard to even get to the 4th plane lol. So I think personally that I did very very well on this game...so far😂😂. But that’s also a flaw. If it wasn’t so hard to make the planes I would probably be on plane 50 already! Part of the reason it’s so hard to even make a plane is because the amount of coins u need to even get a number 2 or 1 plane on the plane board is now the ridiculous part. 🤣🤣😂😂. Please make the prices lower for the planes to be on the plane board. Oh and thank you for reading merge plane creators and players. Until I write another review.😂😂😂.Byeeeeeeeeeee.